Amp up the action, and fill your room with theater-like sound. With built-in Wi-Fi, access blockbuster movies, music, and more1 - right on your TV. Plus, easily connect your smartphone with one-touch Bluetooth pairing to start streaming your music instantly11. 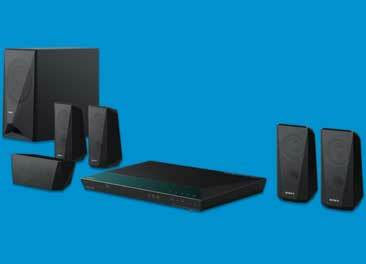 You can now enjoy that perfect party mix in surround sound without the fuss of wires. Bring the movie theater experience home with the Full HD 1080p8 Blu-ray Disc player, vibrant 5.1 channel HD surround sound8, and 1000 Watts of power to immerse you in sound. Easily connect to the internet without the clutter of cables1. Enjoy 3D Blu-ray Disc movies3 in Full HD 1080p and upscale standard DVDs to near HD quality. Bring the 3D experience to your movie collection by converting 2D Blu-rays and DVDs into 3D movies6. The easiest and fastest way to start streaming music from your NFC enabled device to your home theater system. Utilizing NFC and Bluetooth, start streaming music from your mobile device by touching them together11. No NFC, no problem...you can still stream music from your mobile device via Bluetooth. With the Sony Entertainment Network, never run out entertainment options with access to 100+ streaming services including movies, TV shows, music from Amazon Instant Video, Netflix, YouTube, HuluPlus, and more.1 Access the My Sports & Fitness app to help you reach your fitness goals. Experience movies as the directors intended them to sound with Dolby TrueHD and dts- HD Master Audio modes that re-produce high definition, discrete sound for uncompromised quality. Wirelessly access music, videos and photos from your PC, tablet, and smartphone, and play them on your TV11. With the free Sony TV Side View app, you can “Throw” (display) your videos, pictures, and music on your TV from your tablet12. Also, control the player remotely with a Sony Tablet, Android device, iPhone, iPad, or iPod touch. I/P noise reduction for the Blu-ray Disc drive is specifically designed to eliminate playback noise and to protect it from dust and other debris for a better movie watching experience. Gracenote searches across internet apps and external services such as YouTube and Video Unlimited to provide you with detailed information on a wide-variety of movies14. Share your thoughts with your friends on Facebook and Twitter via your TV with the Socialize application13. Easily display your videos and photos on your TV or listen to your digital music by simply connecting your USB storage device7to the Blu-ray player’s front USB slot for ultimate access. Wirelessly stream music throughout your home to Sony Wireless Network speakers4 to ensure the music and party is in every room. 1. Broadband speed of at least 2.5 Mbps recommended (10 Mbps for HD). Content subject to change and may require fees. Wireless connectivity requires an 802.11 home network. 2. Requires 3D content, 1080p 3D HDTV, 3D glasses, 3D emitter, and HDMI cable (at least 10.2 Gbps). 3. Applications must be downloaded from the iTunes or Android application store. Check Android market from your device for compatibility. Requires devices connected to the same wireless home network. 4. Requires Sony HomeShare compatible products and a home network. 5. 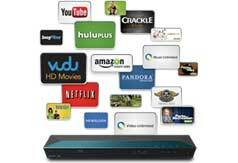 Requires a home network with content stored on a DLNA compliant PC or server, and HomeShare network speaker, dock, or Blu-ray Disc player or home theater system. See dlna.org for compatibility. 6. Simulated 3D image will vary based on source content. 7. Not all USB devices are supported. Please check Owner’s Manual for compatibility. 8. Requires compatible HDTV and HDMI cable sold separately. 9. Requires HDTV with equivalent display and HDMI cable sold separately. 10. Requires devices connected to the same wireless home network. 11. Requires NFC-enabled device and downloadable NFC app. Check device’s user manual for compatibility. 12. TV SideView Application must be downloaded from the iTunes or Google Play application store. Check Android market from your device for compatibility. Requires devices connected to the same wireless home network. 13. Socialize requires user to have Twitter or Facebook account setup on player and internet connectivity. 14. Gracenote requires internet connection.